Because I only have classes Monday through Thursday, I have officially survived my first week of school in Madrid! I’m pretty excited for the semester. My classes don’t seem like they’ll be too hard, and they seem pretty interesting. I have to wake up between 8:15 and 8:30 most days, but my classes are spaced out pretty comfortably so I have enough time to do everything and get to the different buildings. While scheduling our classes, Spain’s laid-back, no pasa nada culture became especially evident. Anytime scheduling conflicts came up, our program coordinators just told us not to worry and it would all work out, or they would only go to some of the classes. Students who wanted internships just had to hold tight and they would start finding them sooner or later. One of my classes actually overlapped until it was moved to a different time, but they wouldn’t have minded if I had to miss part of it every week. During the first week of classes, they really don’t care who shows up to what class, so students are encouraged to try as many classes out as they want. This more chill attitude is very refreshing compared with the fast-paced and structured American culture back home. I could definitely get used to the lack of stress. My first class, International Relations in the European Union, taught in Spanish, should be pretty interesting. We learn about the evolution of the European Union and how the different parts and organizations work together, something that can be very confusing at times. The only problem is the 4,000 word Spanish paper due at the end of the semester. It should be doable, but it definitely won’t be easy. Though there were originally around nine people in this class on the first day, I guess most of them were scared off by that paper because we only had four come back for the second day. Right after the EU class, I have Journalism Abroad: Production as a Foreign Correspondent. Although this class did not interest me at first, I had room in my schedule after I dropped one of my ICADE classes (Organizational Behavior, a core business class) because none of the sections fit with my other classes and people scared me by saying how hard ICADE classes were, especially in Spanish. I’m very glad I decided to give it a try though because it definitely seems like it’ll be awesome. This one is also in Spanish, so it suffered the same fate as the EU class where a lot of people dropped it — there’s now only three of us in this one, which should help us get to know the material and professor well. Our professor says that this course is very popular at his home institution, with enrollment usually at around 120, so we are really lucky to have such a small section of it. Journalism Abroad teaches us the basic information about journalism and reporting, including the Spanish words for everything, and also involves real reporting by us around Madrid using typical journalist equipment. By the end of the semester we are supposed to make a handbook with the information we learned and also create our own TV channel. We’ll definitely learn a lot about the different editing software journalists use, how to effectively tell a story, and be forced to report interesting things about the city we live in. 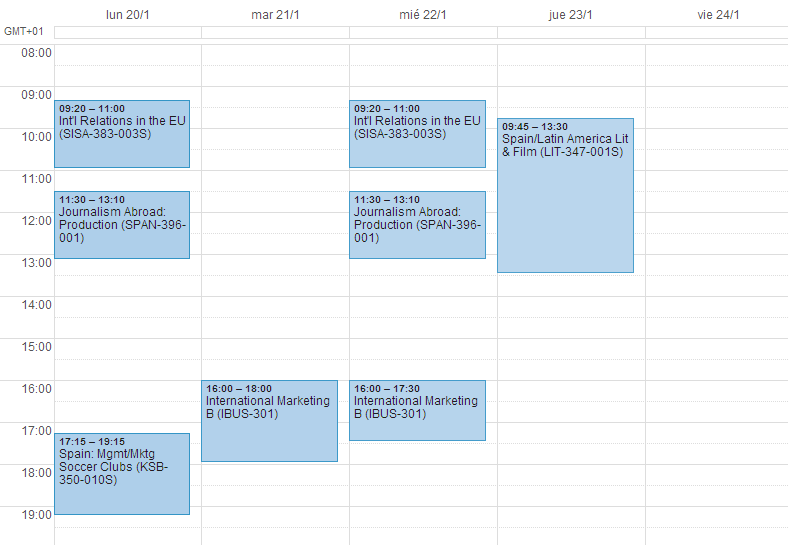 My only class at ICADE is International Marketing. This one is taught in English and it does not seem like it will be too challenging. The material appears pretty straightforward, but I think the professor’s upbeat personality will help keep things interesting. I took marketing last semester and this course basically applies the same information to a global context, teaching us the importance of internationalizing messages and catering to consumers all over the world. There is only one person I know from AU in it, which will force me to get to know some of the other international students in the city, especially since this class includes a group project presentation. If all my other classes at the AU study center were small, it’s probably because everyone is taking Managing and Marketing Soccer Clubs in Spain instead. I would say that around two-thirds of the people on my program are in this class. After we had our first class, I can see why everyone encourages people to take it. The professor is really passionate and knowledgeable: someone questioned the number of wins for one of the teams on his slides, considered it, and then quickly spat out every single championship win the team had, including the scores and a few key plays. The best part about this course though is that only around half of the classes are lecture-type instruction. During the others we go on field trips to places such as the Real Madrid Stadium, an advertising agency, and the company that manages the broadcasting rights for the teams. These trips are not only a fun, hands-on change from traditional classes, but also help us see the Spanish soccer industry from many different angles beyond just watching games or discussing them in a classroom. My final class is Spain and Latin America through Literature and Film, taught in Spanish. The person in charge of the program told us that this professor does a great job and really makes people fall in love with literature, which surprised us a little since people only sign up for the class because they see the word “film” and quickly forget about the “literature” part. After having our first class, though, it seems like the literature part won’t be too bad at all. We do have another paper to write for this one, but we all get to pick a book we like from a Spanish or Latin American author and select our own topics, so it shouldn’t be too bad. The course is designed to give a survey of both Latin American and Spanish literature and cinema over the past 100 years. We’ll learn some broad themes and historical context, but much of the class will be devoted to reading or watching full works or smaller selections. Though we’ll read literature from both Latin American and Spanish authors, we’ll only watch films from Spain. This is pretty good because I haven’t watched many Spanish movies besides Pan’s Labyrinth and Almodóvar films; most of what we’ve watched in classes have been Latin American ones. The professor also seems very knowledgeable and passionate, which should keep things interesting. The only problem with the class is that it’s an almost four-hour long block on Thursday, my last school day of the week. This gives us time to watch and read a lot of things in class, but it’ll definitely be a challenge for us all to stay focused for that huge chunk of time. While I’m of course not crazy eager to do homework instead of experiencing Madrid, my classes this semester do seem like they’ll be interesting and not crazy difficult. Though my three Spanish classes will challenge us, I’m hoping they’ll help me brush up on my language skills, which have gotten a little rusty over the past year, especially since I’m not taking a Spanish grammar class this semester. And, after all, if I can’t handle taking classes in Spanish, I really shouldn’t be studying abroad in Madrid. We’ll see how things turn out! This entry was posted in Study Abroad in Madrid and tagged au, class, culture, daily life, eu, european union, film, icade, international, journalism, latin america, literature, marketing, no pasa nada, schedule, school, soccer, spain. Bookmark the permalink.